This is a recipe from the new cookbook Vibrant Food by Kimberley Hasselbrink (of the blog The Year in Food), and I was drawn to it immediately given it’s those stone fruit summer days. The swelling afternoons of July make me recall something about the smell of smoke from the chimney during summer rains and walking down the stairs in the dark for a cup of cold water. Thoughts that float by like leaves, like feathers, like clouds, like bad similes. I’ve remembered the difference between a floating thought and shoving a thought, and I can see one satin magnolia blossom from out my office window. I recalled a truth that’s easy to forget: you can change the tape. When you think something disturbing—a recalled memory, a worry, or any random bit of negative mental detritus—you can choose to watch it float right past you. You can do it a hundred times a day, a monsoon of feathery thoughts, none resting on you and all of them finally drifting away and leaving you with the smell of smoke & rain from the chimney and a cold glass of water. It will leave you in peace. Leave you to do as you do and be as you are. I’ve been spending these summer days baking and evenings cooking whirlwind dinners for two. Three skillets going, flames high. Oil spattering everywhere. At night, I make, in a blitz, fresh linguine with spiced anchovy shallot butter, fresh tomatoes, and fistfuls of parsley or market vegetable frittatas or my favorite farro risotto with a farm egg & collard pesto. But during the day it’s slower, the steady heat of the oven instead of the flames of the stove and time enough to do the dishes while things bake. I’ve resolved to do something in the coming year, something I don’t usually do. Cook out of cookbooks. I love to use them as inspiration, but by nature I’m an experimenter and generally too mentally floppy to be bothered to follow a recipe. But as I embark on a project this coming year, I’m going to save a lot of my own recipes for said project and instead, on this space, share some of the brilliant work of cooks I love in addition to original recipes. 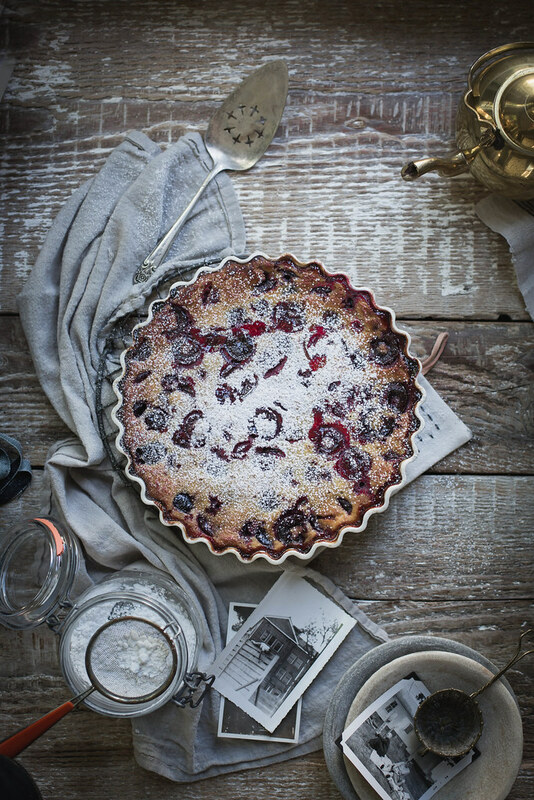 Starting with this Gluten Free Cherry Clafoutis from Vibrant Food. The book is what it sounds like, a chromatic tour of the seasons. It’s the book of an artist, and each chapter is punctuated by lively hues—pale green peas, jewel toned radishes, deep red berries—and all the attendant textures and flavors that go with those colors. She’s a cook after my own heart with recipes that remind me of the sort of food I love to make myself, like Nettle Pesto and even Bee Pollen Chocolate Truffles! Also, There are over 180 photos. I like my cookbooks with photos, what can I say. It ignites taste imagination, and inspires me to really explore the author’s culinary voice. You can get a copy of Vibrant Food here. I think as I venture into this cookbook exploration, Vibrant Food, will be a mainstay this year. Preheat the oven to 375°F. Grease a 9-inch pie pan with unsalted butter. Sprinkle with 1 tablespoon of the sugar. Arrange the cherries in a single layer on the bottom of the pan. Set aside. In a bowl whisk together the eggs, buttermilk, remaining sugar, almond flour, brown rice flour, vanilla ginger, and salt until smooth. Pour evenly over the fruit. Bake for about 50 minutes, until golden brown around the edges and set in the center. Test by inserting a toothpick in the center—if it comes out clean, the clafoutis is ready. Allow to cool slightly, then dust with confectioners' sugar and serve. yum this looks divine. 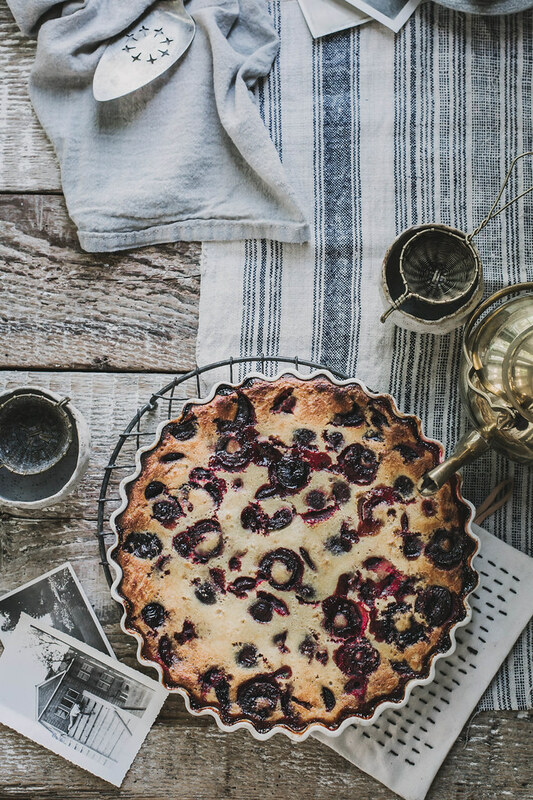 i’ve been debating whether to buy vibrant food and i definitely think i will be after seeing this clafoutis recipe… thanks for sharing another great recipe beth! I have always loved this french classic desert but am trying to eat more gluten free lately and have two daughters who only eat GF deserts. I will definitely be making this soon. Your photography is stunning! 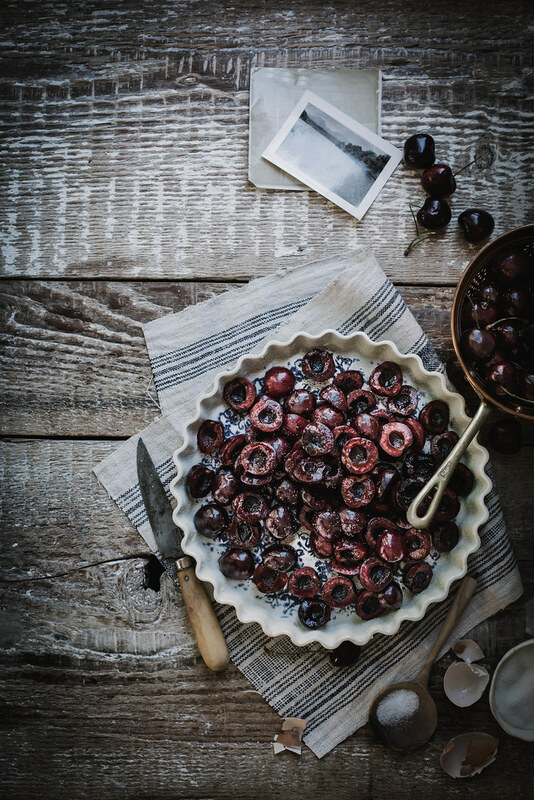 I’m so excited for cherry season, I’m cooking with them tomorrow morning…this recipe has given me lots to dream about tonight! Hope you’re ok with being my literary, culinary and photographic hero? And the similes worked a treat. Thanks for catering to us gluten-phobes! Hé, I like very much your taste and I follow your posts… Best regards from France. WOW! so in love with your pictures and we are always happy to see glutenfree recipes. looks so delicious! Such a nice, deep and dark colour from the cherries. 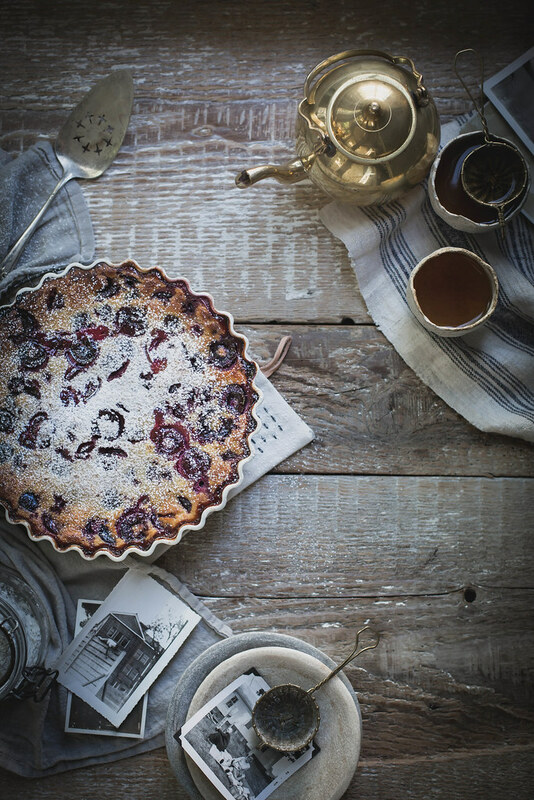 This clafoutis looks delicious! Yum! I never cook out of cookbooks either, but your reasons are sound, and maybe I’ll start trying to do so as well 🙂 Love those shots of your cherry-stained hands… we’ve all been there. 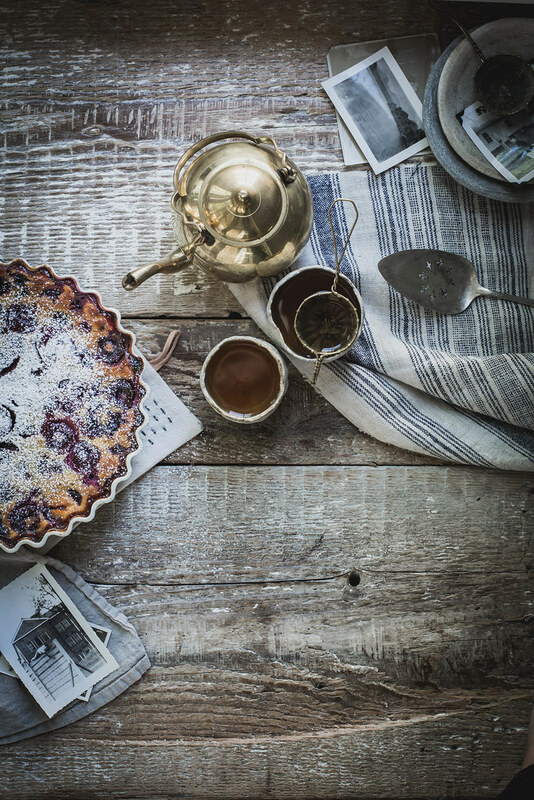 Love the recipe, and love, love your photography! 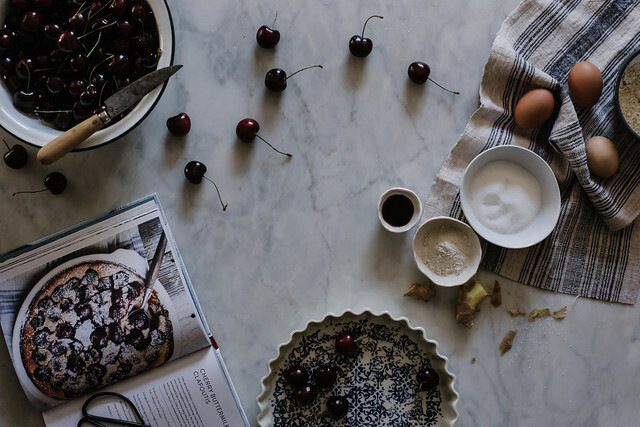 Not having to respect a special diet, I made a “regular” cherry clafoutis recently – one of my favorite desserts this summer. Great to see that it works fine gluten free… and I adore your vintage looking pics! I love the cherry-stained fingers. And the slow meditative pace of this. And how it becomes a part of your own narrative. Just exquisite. Thank you. Beautiful cake…! But I think I fell in love with the photographs! I think that, as a cook, it takes a certain kind of humble respect to move away from your own recipes, and let your trust fall into that of another’s. It’s easy to cave into your kitchen clockwork. I can’t wait for this project, assuming it’s as absolutely brilliant as everything else you produce (I have no doubt it will be). 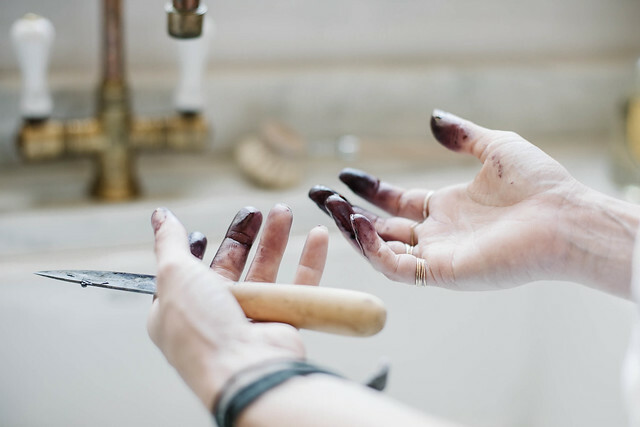 Those hands, stained, tell a story in themselves, and goddangit even the table you took these photos on is gorgeous. You have such a way of immersing others into yourself. Thank you, thank you, thank you. Cherryhands! Also, am I sensing a magic cookbook coming our way? Beautiful, looks delicious. I am also trying to use cookbooks more, a very inspiring place to get yourself lost in! I just made a cherry skillet pie and I am trying to find a way to remove the cherry stains from my fingers. Next Easter I will be using them as d ye! The colors in these photos are so beautiful! I can’t wait to make this. Oh. My. Goodness. I actually think I just started drooling over my keyboard a bit. Thank you for writing such a completely stunning blog. A little messy but looks like it’s all worth it in the end. Gluten free…my wife is all over this! This is so beautiful. I love the old photos in the photograph. It’s those darling touches which make your pictures so unique. As always your writing brings with it gentle reminders in the real life realm. Thank you for sharing this! The cookbook looks beautiful, and I hope it inspired you to write your own. You have quite a few fans waiting. Your photos are stunning! 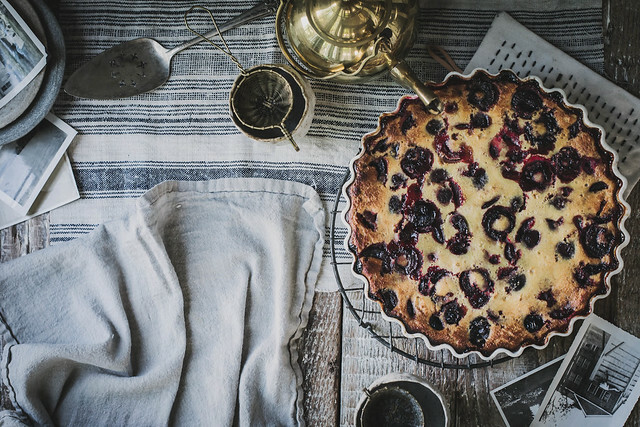 I’ve never been a huge clafouti fan but yours looks amazing! This looks and sounds gorgeous – and as always, stunning photography! Many thanks. I like the sounds of this “project…” Your words and images continue to create my favorite space to cuddle up in internet time. I thank you, always. Looks delicious! 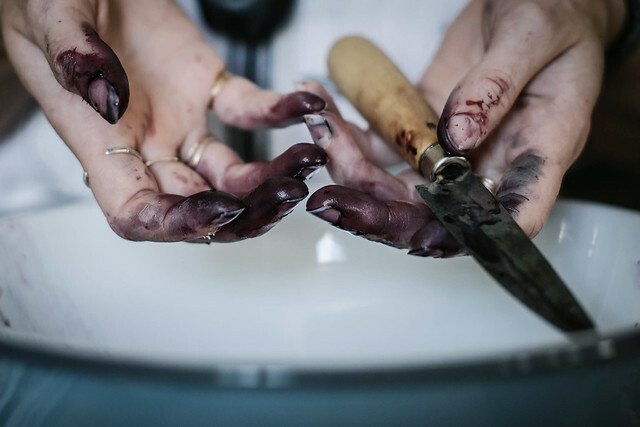 And that’s exactly what my hands looked when I prepared my black cherry jam! Lovely! Wonder if almond or coconut milk would substitute successfully for the buttermilk? While, naturally, the flavor and consistency would be a bit different, I see no reason it wouldn’t work. This sounds seriously amazing. Your pictures are gorgeous, too! Beautiful, Beth. I keep hearing of Vibrant Food, but you’re one of the few that has managed to make it look so drop-dead masterful. I can’t wait to hear about your new project, when the time comes. Keep creating. Edlyn. Yes, it’s correct. That’s the ratio she uses in her book, and it works beautifully. You are correct however, there is a wide range of egg to liquid to flour ratios that can be found in clafoutis recipes. These are beautfiul! I love the cherry stained fingers. And hey I noticed your astrological chart! I’ve got a fire moon and a cardinal sun myself! Your post was lovely. My dad passed away early that same morning, and it’s been a hard hard month ever since. Your post rings true for me in forging ahead with life without him. Thank you for great writing. Love cherries too! So, so beautiful! Love this! this makes me rather impatient for cherry season! thanks for sharing. To keep it gluten free, can I use oat flour & almond flour (brown rice flour is impossible to find where I live)…? I think that would work, but I can’t say for sure because I haven’t tried it!